GAZA CITY, Gaza Strip -- Thousands of Palestinians staged a mass protest along Gaza's sealed border with Israel on Friday, some burning Israeli flags while Israeli soldiers fired tear gas and live bullets from across the border fence. At least nine Palestinians were reported wounded in what was the third mass rally in two weeks. Since late March, 27 Palestinians have been killed and hundreds wounded by army fire during such rallies. On Friday, most of the demonstrators assembled in five tent camps located several hundred yards from the border fence. Smaller groups moved closer to the fence, throwing stones, torching tires and burning large Israeli flags. Israeli forces fired tear gas, rubber-coated steel pellets and live rounds. The military said that demonstrators hurled an explosive device and several fire bombs near the fence in what it said was an apparent attempt to damage it. Footage distributed by the military showed an area of the fence made up of several layers of barbed wire coils. Protesters stuck a Palestinian flag into the fence and affixed a rope, using it to tug at the coils. One man threw a burning tire into the fence, while another was seen walking nearby with the help of a crutch. Rights groups have branded the Israeli military's open-fire regulations as unlawful, saying they permit soldiers to use potentially lethal force against unarmed protesters. 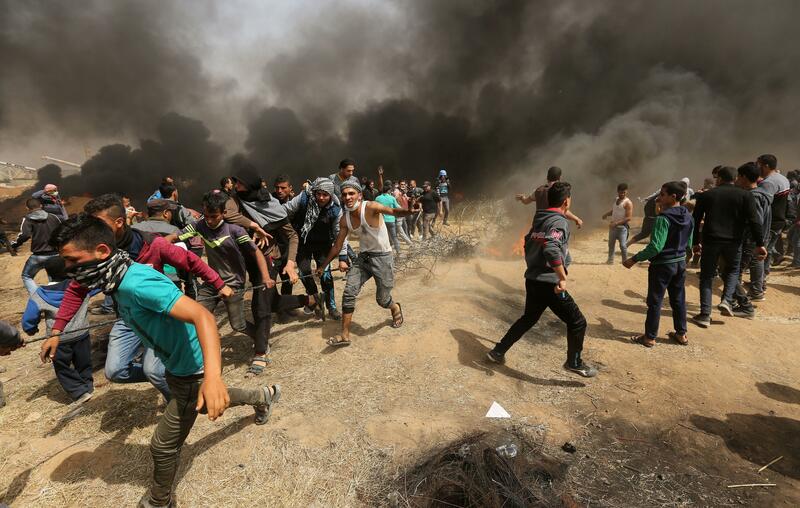 Israel has accused Gaza's Islamic militant Hamas rulers of using the protests as a cover for attacks and says snipers only target the main "instigators." The marches have been organized by Hamas, but large turnouts on two preceding Fridays were also driven by desperation among the territory's 2 million residents. Gaza has endured a border blockade by Israel and Egypt since Hamas overran the territory in 2007, a year after winning Palestinian parliament elections. The blockade has driven Gaza deeper into poverty, with unemployment approaching 50 percent and electricity available for less than five hours a day. The marchers are protesting against the blockade, but are also asserting what they say is a "right of return" of Palestinian refugees and their descendants to what is now Israel. Several thousand people gathered Friday at a tent camp east of Gaza City. The camp was decked out in Palestinian flags. At the entrance, organizers had laid a large Israeli flag on the ground for protesters to step on. In the camp, 37-year-old construction worker Omar Hamada said he is protesting to draw world attention to Gaza and get the border reopened. "We want to live like everyone else in the world," he said. "We came here so the world can see us and know that life here is miserable, and that there should be a solution." Hamada was critical of Hamas, saying the group has set back Gaza by decades, but added that "this is the reality and we have to deal with it." Critics argue that Hamas' refusal to disarm is a key reason for the continued blockade. One path toward lifting the blockade would be to have Hamas' political rival, West Bank-based Palestinian President Mahmoud Abbas, take over the Gaza government, but recent Egypt-led talks on such a deal have run aground. The debate over Israel's open-fire regulations has intensified with a rising number of dead and wounded since the first protests March 30. In all, 34 Palestinians were killed in the past two weeks, 27 during protests. Seven were killed in other circumstances, including six militants engaged in apparent attempts to carry out attacks or infiltrate Israel. Gaza's Health Ministry said more than 1,300 Palestinians were wounded by live fire in the past two weeks. The Israeli military has argued that Gaza militant groups are trying to turn the border area into a combat zone, and said it has a right to defend its sovereign border. It has said that soldiers fire live bullets as a last resort, in a "precise and measured manner." Yair Lapid, the leader of Israel's centrist Yesh Atid party, called Hamas a "despicable terror organization" and accused it of exploiting civilians. He said the Israeli military is "operating against it (Hamas) with determination and according to international law." Human rights groups have said soldiers can only use lethal force if they face an apparent imminent threat to their lives. The Israeli rights group B'Tselem said Friday that open-fire policy must not be dictated by worst case scenarios, such as a feared mass breach of the border. "An order to open live fire at unarmed protesters is manifestly unlawful," it said. Another Israeli group, Breaking The Silence, published a statement by five former snipers in the Israeli military who said they were "filled with shame and sorrow" over the recent incidents in Gaza. "Instructing snipers to shoot to kill unarmed demonstrators who pose no danger to human life, is another product of the occupation and military rule over millions of Palestinian people, as well as of our country's callous leadership, and derailed moral path," said the statement. The group has been criticized in Israel for publishing often anonymous testimony by current or former Israeli soldiers who have misgivings about their military service and treatment of Palestinians. The five ex-snipers in Friday's statement were identified by name.